Don't be Les Miserables at your next event. Advertise with provocative Broadway Flyers! Sure to please, these Flyers feature a shadowy background with bright lights and a performer's silhouette. Professional quality Flyers, soaring sales, and the Broadway Party of the year? Sounds like a hit! 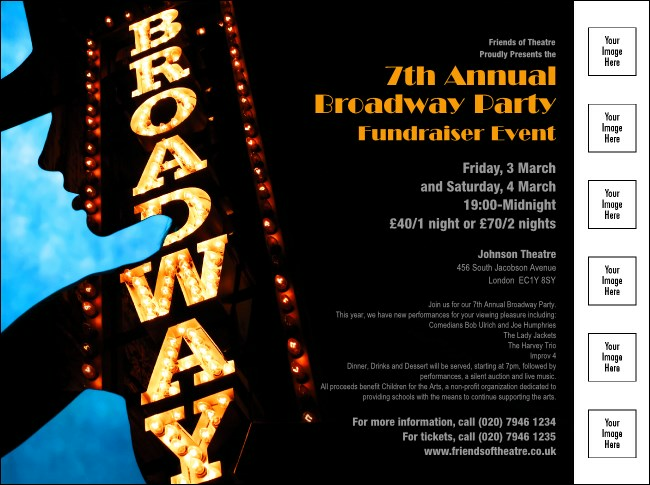 Don't miss out on the rest of UK Ticket Printing's Broadway Event Kit, including matching Posters, Event Tickets, and Invitations!